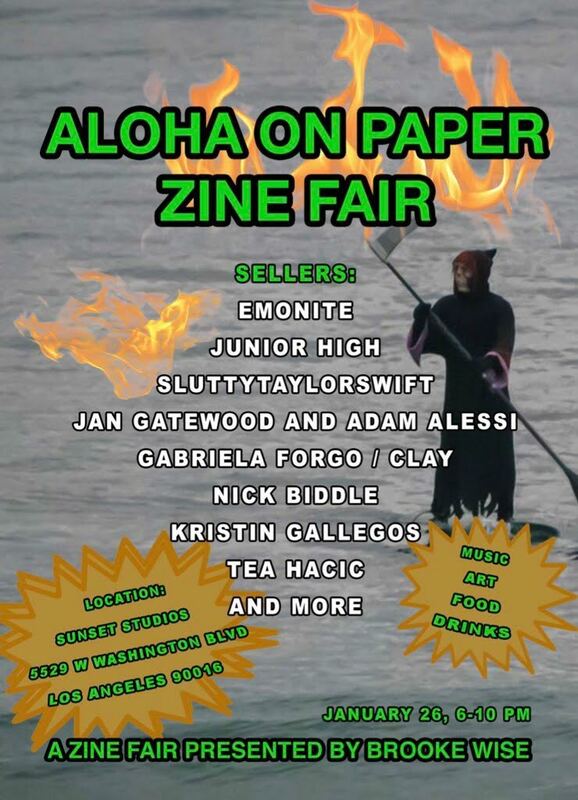 This weekend Brooke Wise is hosting Aloha on Paper Zine Fair featuring music, art, food, and drinks at Sunset Studios. Some sellers will include Emonite, Junior High, Sluttytaylorswift, Jan Gatewood and Adam Alessi, Gabriela Forgo/ Clay, Kristin Gallegos, Tea Hacic and many others. The event will take place Saturday, Jan. 26 from 6-10 p.m.
Curator Brooke Wise studied fine art before diving into the world of curating art shows. Wise splits her time between Los Angeles and New York. Some of her past shows include “Smothered Awake” and “Aloha from Hell Film Festival” both of which took place in LA. Her unique view of art plays into he success in the curation and thought process of the shows.